A system of competing political parties that gives citizens a voice is widely considered one of the core principles of liberal democracy, and this feature is common to a wide range of countries around the globe – even ones where the quality of choice at the ballot box is questionable. Parties appear to matter in practice, not just theory: In countries where more people are unaffiliated with any political party, popular support for representative democracy is also lower, according to a new Pew Research Center analysis of public opinion in 35 countries. 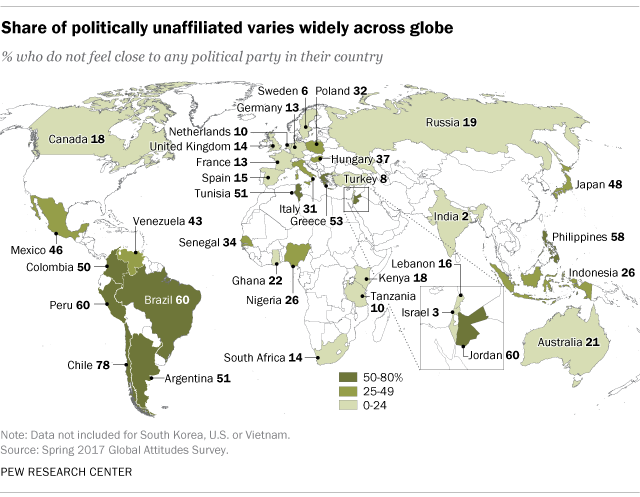 Across the nations surveyed, a median of 26% do not identify with any political party in their country, though that percentage ranges from as low as 2% in India to as high as 78% in Chile. And Chile is illustrative of the apparent link between skepticism of democracy and party unaffiliation. Although a global median of only 17% oppose representative democracy as a form of government, roughly a third (35%) of Chileans hold this view. Disenchantment with established democracy may help explain why less than half of registered voters turned out for Chile’s recent presidential election. Similar shares in Brazil (33%) and Peru (32%), two nations with compulsory voting laws, exhibit skepticism about representative democracy. In both countries, six-in-ten people do not support any political party. 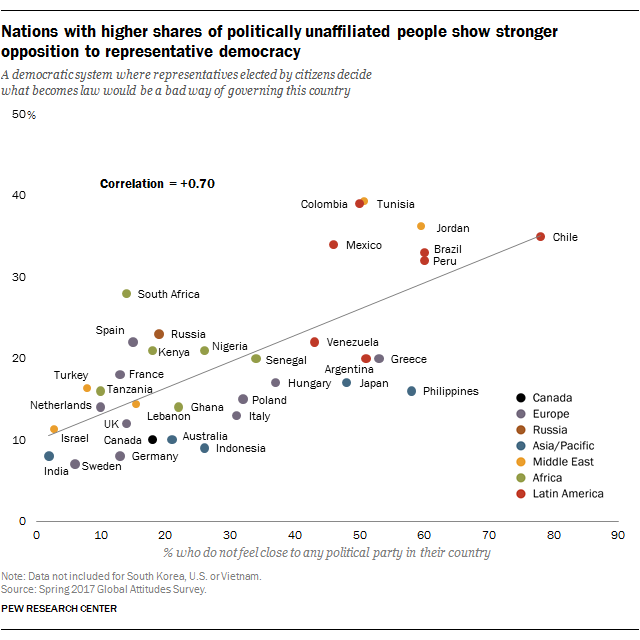 In fact, many of the nations with both poor views of democratic representation and large numbers of politically unaffiliated citizens are in Latin America. Overall, a median of 33% in the Latin American nations surveyed say a representative democracy is a bad way to govern their country, and a median of 51% do not support any political party. Data from the AmericasBarometer shed some light on these findings. Its recent survey found that across 17 Latin American nations, a median of only 41% trust elections in their country, and a majority (67%) believes that more than half or all politicians are corrupt. The dynamics of political affiliation and views of democracy vary in the Middle East and North Africa. Overall, a median of 16% in the region are politically unaffiliated. But in Jordan, where 60% of people do not identify with any party, more than one-third (36%) say democracy is a bad way to govern their country. And in Tunisia, viewed by many as the democratic triumph of the Arab Spring, roughly half (51%) are politically unaffiliated and nearly four-in-ten (39%) oppose representative democracy. Notably, Tunisia’s emerging democracy continues to face threats, according to a 2018 Freedom House report. In countries where relatively few people are politically unaffiliated, assessments of representative democracy are less negative. For example, a median of just 15% across the 10 European nations surveyed do not support a political party, while the same modest share sees representative democracy as a bad way to govern. The survey finds the least skepticism of democracy in Israel and India – two democratic systems founded in the middle of the last century. Only 3% of people in Israel and 2% in India are politically unaffiliated. In both countries, roughly one-in-ten hold negative views of democracy (11% in Israel and 8% in India). Note: Although the United States, South Korea and Vietnam were surveyed in the Spring 2017 Global Attitudes Survey, data were not included because of differences in question wording on party affiliation. Janell Fetterolf is a research associate focusing on global attitudes at Pew Research Center.